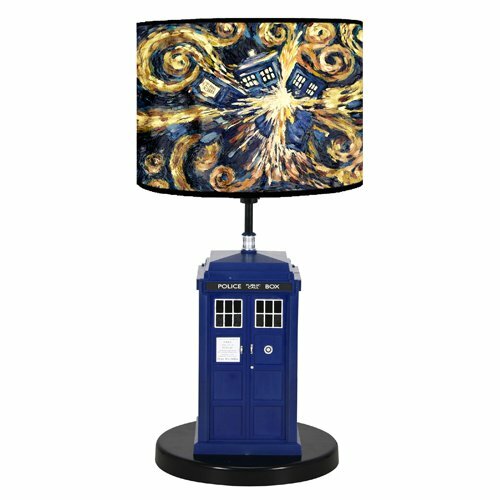 Inject a bit of Wibbly Wobbly Timey Wimey stuff into your own bedroom or dorm room by creating a unique space of Doctor Who room decor. There are some very easy and quick ways to theme and transform a room into something truly out of this world and dimension. Something that any Time Lord would be proud of. Some large posters and wall decals are great options if you have a big enough area of blank wall space to fill. 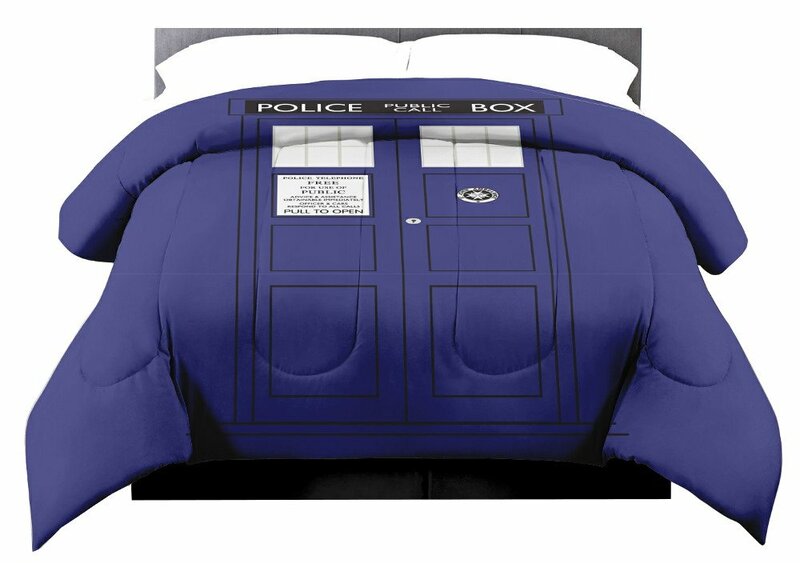 ⭐ Any geek fan of the cult classic TV series would be in instant awe of a Dr Who room decor theme. Try something different by placing up a favorite poster scene on the ceiling and this is a great choice for a bedroom or dorm room where you may be limited on space. 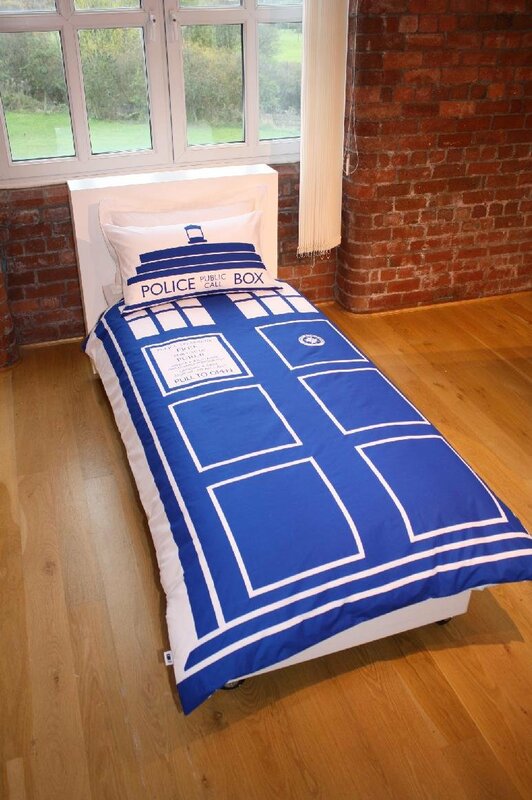 A good way to start with your Doctor Who room styling is to begin with the larger items first. Add in the eye-catching items that no-one is going to miss because of the size. These will have the biggest impact on the overall look. A few large pieces can quickly give an overall impression of the look and feel that you’re going for. Luckily, they don’t need to be expensive either. Decal stickers and posters fall into this category. 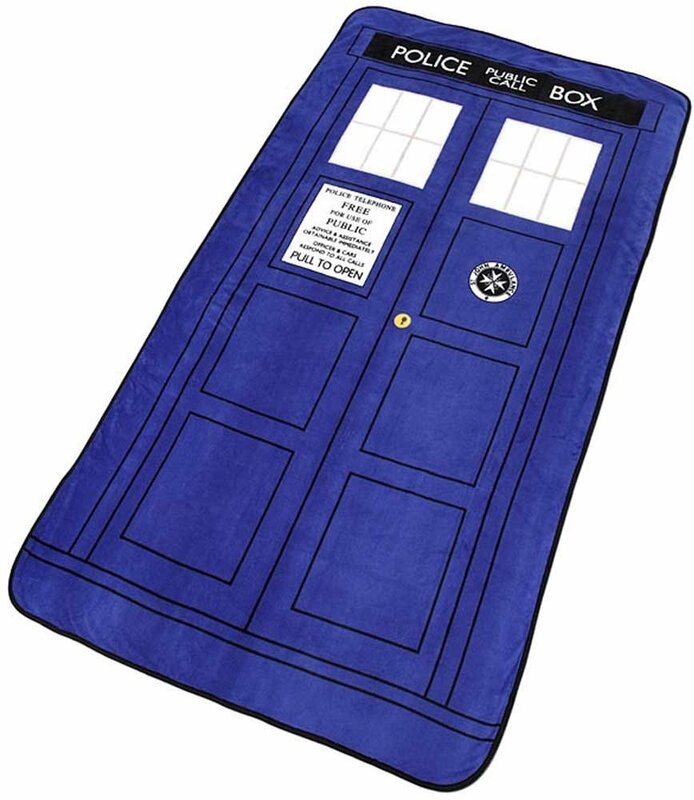 I’m not entirely sure how you could trick friends and family into really thinking that your room is bigger on the inside just like the real time travel space machine that The Doctor and his companions use. However, having a few large mirrors and especially a big mirror opposite a window will help to make the room feel lighter, brighter and more spacious inside. 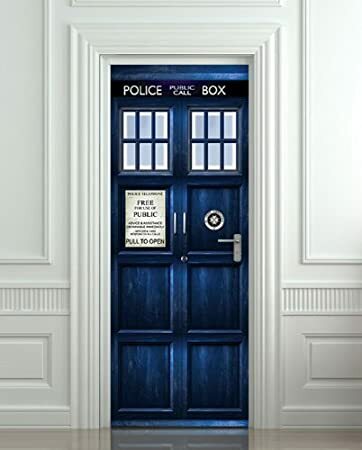 A really fun item is a Tardis door sticker decal which you peel and place over your door. The great thing about it is that anyone approaching the room is going to have a very good idea of what they are likely to see once they step inside. 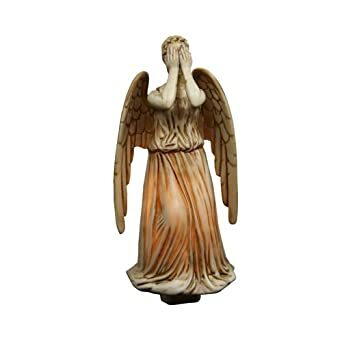 For a wall decoration which is more fun than threatening, you really can’t get much better than the Wibbly Wobbly Timey Wimey quotation uttered by the very gorgeous 10th Doctor, David Tennant, in the episode called Blink which happened to be the very first one featuring the creepy Weeping Angels. 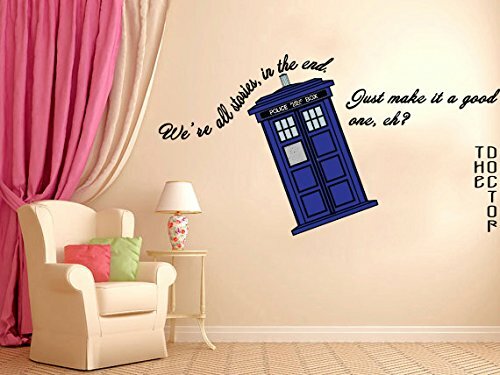 A cool looking Tardis wall decal is going to appeal on a number of counts. 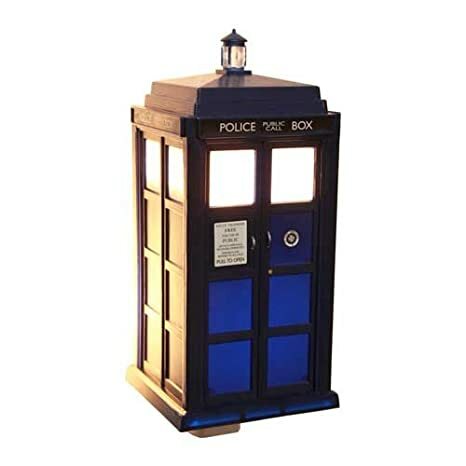 You can get one that has the very famous quotation shaped into a Tardis. Even a non-fan could recognize that shape and the Doctor Who blue as being from the BBC series. And it’s just such a fun speech by a real favorite Dr. David Tennant is worth watching over and over. 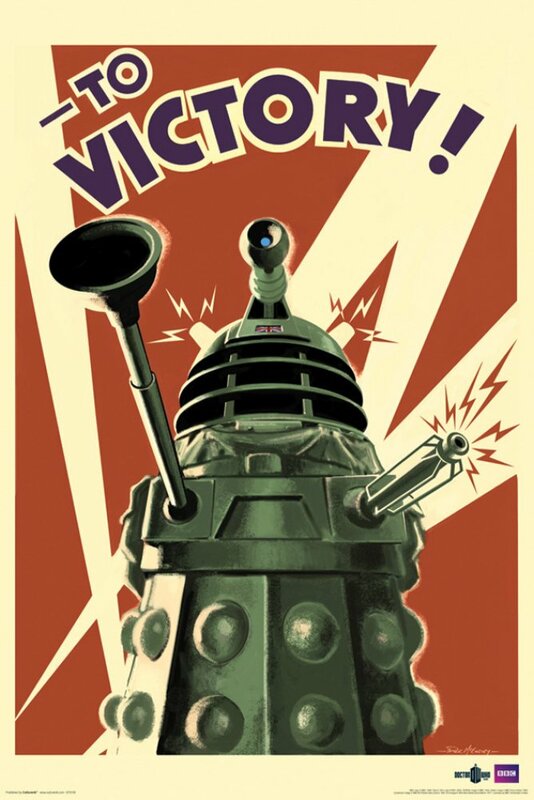 This retro inspired To Victory Dalek poster is really awesome looking. It’s a seriously cool design and a more grown up piece of artwork that teens and adults should really appreciate. Now this really is Who for grown-ups. My daughter and I disagree on the Daleks a bit. She gets a bit bored with them because they have appeared in so many episodes through the years and she prefers to see new monsters and aliens or ones featured much less. I am really fond of these very threatening exterminate and seek and destroy war machines since I grew up being scared of them. This poster has the right kind of angry and brutal vibe that I’ve come to expect of this race. I made a Police Public Call Box sign for the top of my daughter's bedroom door. It's on the outside of the door just like with the real Tardis. As soon as I saw the idea of a very cool door decoration, I got busy making a few items myself to put on my daughter’s door since we are in the on-going process of giving her room a Dr Who makeover. The first was to make a Police Public Call Box sign to stick across the top of her door. 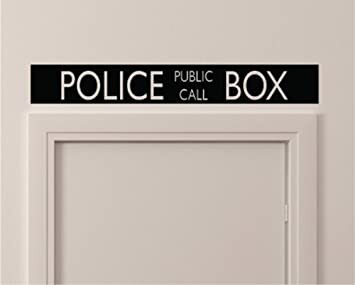 This police box sign has a black background and white text over the top. 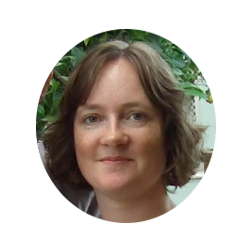 You can do something very similar in a word processing package or a graphics package. I printed mine off onto card, laminated it and stuck it up with Blu Tack. It looks really effective when you walk up the stairs and see it across the door. I also made a Pull to Open door sign to stick on the entrance to my daughter's bedroom. It looks pretty cool. The other main thing was to add on a Free for use of public sign which is another instantly recognizable feature on the front of the Tardis. You can find free ones to print online or, again, you can make your own. You really just need a word processing package to type the words down the page. I printed this onto a cream color card, framed it on some shiny silver card and then laminated it. This is so appropriate for a door of any type whether to a cupboard or closet or the actual room door because of the Pull to Open wording. This is in the middle and I’ve surrounded the rest with posters and prints which have all been laminated to last longer. Wall and door decor can quickly give your room just the vibe and makeover you’re looking for. When you’ve got some of the bigger pieces and items sorted, you can start to move on to smaller items and ones which are going to add in the detail to make your space look really great. Throw pillows can help your theme considerably as well as being nice and comforting to have. You can never have too many to make a room look inviting and homely. 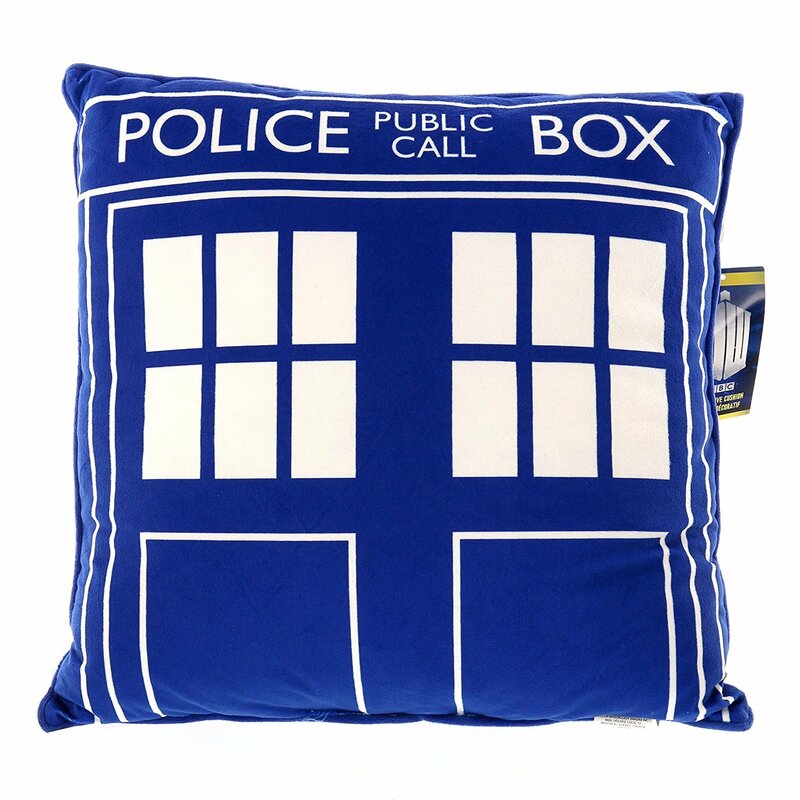 I really loved this square Tardis throw pillow which looks pure geek to me. If you have any old T-Shirts going spare, consider cutting them down into a square of fabric and sewing into your own pillow or cushion. Maybe the t-shirts got too small but you can’t bear to throw them out since they have your favorite character, scene or quote on. Sew a simple square cushion from the t-shirt fabric. You can buy your own pillow pads or inserts and just make sure that the section of fabric will fit over the top. If you feel creative enough, you can try to make something similar yourself but because it is so very clever, I just want to buy this instead. If you don’t like sewing, you can frame a potion of a favorite tee instead. Alternatively frame the whole thing if you don’t mind spending a small fortune on a large enough frame. That way you can make your own unique piece of wall art for your room. 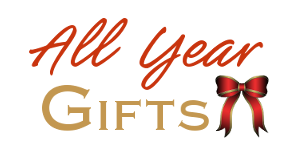 Need a bedside light or a table lamp? How about a tardis table lamp with the 11th Doctor, Bow Ties are Cool Matt Smith, and his companion Amy Pond across the shade. Personally I think the lampshade makes it more appropriate for a kid’s bedroom, however, the comments say that the lampshade is indeed removable so I would be very tempted to replace it with a plain blue or black shade instead because I really love the Tardis base on it. So don’t necessarily be put off if you’re older and wanting a suitable themed light to use. you can adapt it to suit. 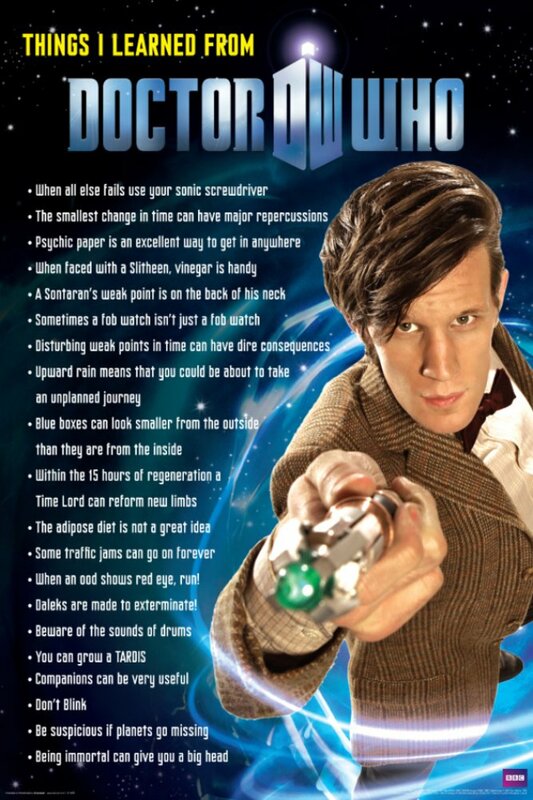 Not that I don’t like Matt Smith. Although if it had David Tennant and my favorite companion Donna Noble across the shade, I’d probably leave it well be. That looks like a Winder on there too and that makes it a little bit creepy to have next to where I prefer to have sweet dreams rather than nightmares. 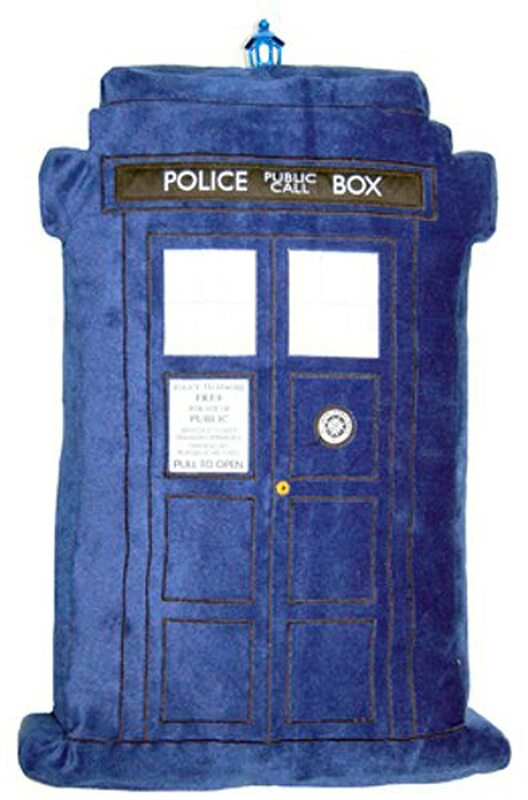 If you loved the episode with Van Gogh called Vincent and the Doctor which personally I found an excellent bit of viewing and very touching, you may fall in love with a Van Gogh style exploding Tardis soft throw blanket which can instantly jazz up a sofa or a bed in your Whovian style. Who says that Dr Who is for kids? A lot of adults love this long-lived series too. I can remember watching it when I was young and being scared of the Daleks, in particular. Now I love watching it with my own daughter who has gotten interested in some of the older doctors that I used to watch which is great. So we both enjoy watching the classics as well as the modern appearances. The colorful and striking design is a wonderful and more arty way to add this theme into your space. Have fun choosing how to decorate your room.